So let’s take a look at the SEO paradigm and break it down a little so we can understand what goes into an SEO package (if done properly) and what three factors play a role in the deliverables of any good SEO Services program. 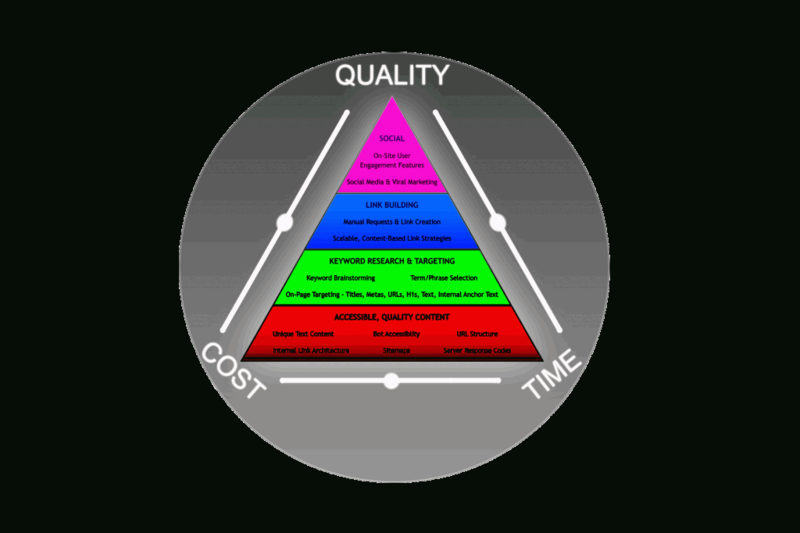 In the above graphic, please note the four tiers of the SEO Triangle (more on each of these in a later post). They are the basic building blocks of any successful SEO program. The problem is that they all take time, money and energy to create good quality (or better yet…GREAT Quality) results. So if we agree that we have to have great quality results, that we want those results as quickly as possible and that we want to pay only what we absolutely have to and not a penny more…how do we decide what happens next? Easy enough. If you don’t care what the cost is or have an unlimited budget, we can go as fast as possible (while still maintaining a natural look to Google) and get right to work to accelerate your SEO program. Again, your price is likely to be very high for this work. There is also an element of risk with any “accelerated” SEO program because Google may flag too much activity as un-natural and penalize your site for that activity. Only go this route with an experienced SEO that knows where the edge of the envelope is so you don’t fall off! This is where most people get into trouble. There are a lot of SEO’s out there who promise you fast results like “top of Google in 30 days”. The bad part is that some people actually fall for this stuff. Let me explain one scenario that I have seen over and over again. Let’s say you own a web site that sells baby products like diapers, clothes, feeding bottles and more. Maybe you built the site yourself or had someone else build it, either way, the site has never been optimized for search engines. What these low level (I hesitate to call them scammers) SEO’s do is promise you top of Google in 30 days for only $250.00 or your money back! Or worse, no charge until you are on top and then it’s $250.00/month while you stay there. Let’s face it folks, anyone can get a web site to rank for “Tallahassee Baby Supplies by Joan, Inc.” in less than 30 days but how much traffic is that going to bring you? Is that a keyword that Google has indexed and shown as having “X” amount of traffic per month? I highly doubt it. You can have a high quality SEO program at a very affordable rate if you don’t care that it takes 5 years to rank well for your keywords. Again, an effective SEO program does require a lot of effort and expense. The longer you allow for results the more the work can be spread out over a greater period of time and thus you have a lower monthly out lay. Please note that in the end, you may actually end up spending more for the final product. Pick your SEO Services firm carefully. Make sure you ask the kind of questions that will give you the comfort level you need. A little bit of research on your part will go a long way and empower you to be able to ask some of these questions. In the end, people usually do business with people they trust. If your SEO Services vendor has not yet earned that trust, then why would you give them your business? One last thought on cost…most SEO Firms will evaluate each customer individually and are capable of building custom plans that allow even the smallest of businesses to begin an SEO Program regardless of pricing shown on their web site or printed materials. If you think you cannot afford SEO, ask your SEO Vendor for a custom “starter plan”. If they are reputable, know what they are doing, they should be able to craft a plan that you can afford that will deliver some benefit to your SEO program. From there you can grow your business and therefore the SEO can EARN more business from you once you start to grow. 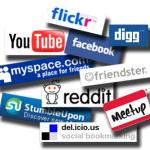 Social Media and SEO: How does it affect your rankings? You just can’t ignore it any more. Social Media is here to stay and now it’s a part of SEO. How prevalent is Social Media in today’s world? Take a look at this video and then you tell me…and while you watch it, keep in mind it is almost 1 year old, which means it is already obsolete and the information needs to be updated again. I think you will find it “eye opening” as to the shear numbers using and joining social networls. No wonder the search engines could no longer ignore this new and over whelming endeavor. But you decide for yourself. Is Social media hear to stay? Or is it a passing fad that will come and go like “parachute pants” in the 80’s? If you have wondered whether or not Social Media has an impact on your Search Engine Results Page ranking, you are not alone. If you have ever suspected Google, Yahoo and Bing of using Social Media in their algorithms then again, you are not alone, nor are you wrong. In December of 2010, Matt Cutts posted a video on Youtube that basically says Google is using “social media signals” in the SERP’s (search engine results pages). Bing followed suite shortly after. So what is a “social media signal’? Good question. 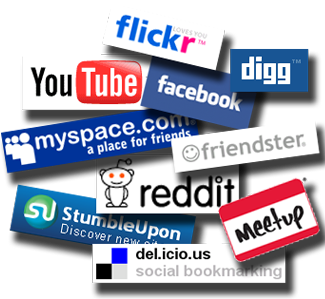 A social media signal is anything that a “user” or subscriber interacts with on any social media. It could be a “like button” or “tweet this” button. It could be as simple as a user posting a link to a site on the FaceBook page, Twitter Account, YouTube or any number of other “social media” outlets. Now, please do not confuse this with “link-building”. The search engines are not indexing links from these sites…at least not yet. They are however using these signals to determine whether or not a web site is legitimate or spam. For instance, if you own a web site and have a nice size following on FaceBook, Twitter and YouTube (just to name a few), then you are more than likely going to be given more credibility with the search engines. Why? Because the search engines see that your peers and customers are interacting with you on these sites and that you are truly providing something valuable to them. As and SEO Services company, we always encourage and even help our clients set up, use and build their social networking platforms. It’s an essential part of today’s business world. And it will only grow in popularity and necessity. That’s why click-finders.com will always recommend starting your social media marketing program yesterday! This is the best chance to get the world-standard SEO software at a special Christmas price — and help your business enter a prosperous New Year. Check the rules, join the cruise and claim your Christmas offer!